The optional Media Embed and Semantic Media Embed plugins, introduced in CKEditor 4.5, allow to embed resources (videos, images, tweets, etc.) hosted by other services (called the "content providers") in the editor. When either Media Embed or Semantic Media Embed plugin is enabled and the content provider is configured, the button is automatically added to the toolbar. Once clicked, it opens the Media Embed dialog window that lets you add the URL of the resource to be embedded. You can also paste that resource&apos;s URL into the editor content and it will be automatically embedded if the optional Auto Embed plugin is enabled. We recommend to use the Iframely proxy service which supports over 1800 content providers such as YouTube, Vimeo, Twitter, Instagram, Imgur, SlideShare, or Google Maps, but you can configure the widgets to use another proxy service of your choice. The sample below uses the Media Embed plugin together with the Auto Embed and Enhanced Image plugins. Additional widget styles are defined to control widget size and alignment. Try embedding more resources like the following. You can either paste these URLs into the editor or use the Media Embed dialog. Rosetta is a robotic space probe built and launched by the European Space Agency. Along with Philae, its lander module, Rosetta is performing a detailed study of comet 67P/Churyumov–Gerasimenko (67P). On 12 November 2014 the mission performed the first soft landing on a comet and returned data from the surface. Rosetta was launched on 2 March 2004 on an Ariane 5 rocket and reached the comet on 6 August 2014, becoming the first spacecraft to orbit a comet. (Previous missions had conducted successful flybys of seven other comets.) It is one of ESA&apos;s Horizon 2000 cornerstone missions. The spacecraft consists of the Rosetta orbiter, which features 12 instruments, and the Philae lander, with nine additional instruments. The Rosetta mission will orbit 67P for 17 months and is designed to complete the most detailed study of a comet ever attempted. The spacecraft is controlled from the European Space Operations Centre (ESOC), in Darmstadt, Germany. The planning for the operation of the scientific payload, together with the data retrieval, calibration, archiving and distribution, is performed from the European Space Astronomy Centre (ESAC), in Villanueva de la Cañada, near Madrid, Spain. It has been estimated that in the decade preceding 2014, some 2,000 people assisted in the mission in some capacity. The probe is named after the Rosetta Stone, a stele of Egyptian origin featuring a decree in three scripts. The lander is named after the Philae obelisk, which bears a bilingual Greek and Egyptian hieroglyphic inscription. A comparison of its hieroglyphs with those on the Rosetta Stone catalysed the deciphering of the Egyptian writing system. Similarly, it is hoped that these spacecraft will result in better understanding of comets and the early Solar System. In a more direct analogy to its namesake, the Rosetta spacecraft also carries a micro-etched nickel alloy Rosetta disc donated by the Long Now Foundation inscribed with 13,000 pages of text in 1200 languages. The spacecraft performed two asteroid flyby missions on its way to the comet. In 2007, Rosetta also performed a Mars swing-by (flyby). The craft completed its flyby of asteroid 2867 Šteins in September 2008 and of 21 Lutetia in July 2010. 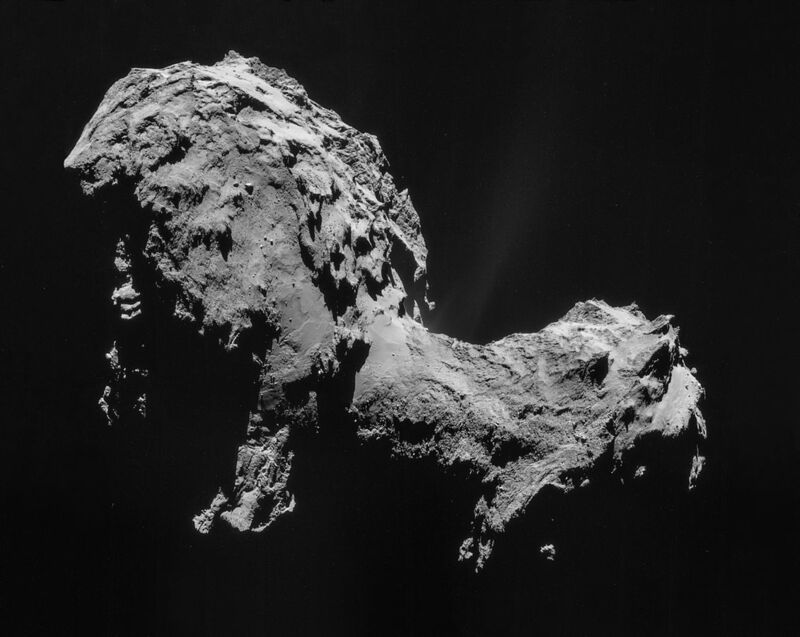 On 20 January 2014, Rosetta was taken out of a 31-month hibernation mode as it approached the comet. Rosetta&apos;s Philae lander successfully made the first soft landing on a comet nucleus when it touched down on 67P on 12 November 2014. Astrophysicist Elizabeth Pearson said that although the future of the lander Philae is uncertain, Rosetta is the workhorse of the mission and its work will carry on. The entire mission was featured heavily in social media, with a Facebook account for the mission and both the satellite and the lander having an official Twitter account portraying a personification of both spacecraft. The hashtag "#CometLanding" gained widespread traction. A Livestream of the control centres was set up, as were multiple official and unofficial events around the world to follow Philae&apos;s landing on 67P. // Load the default contents.css file plus customizations for this sample. // 100% of the editor width).